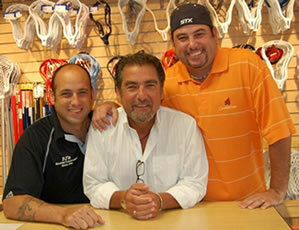 PJ’s Soccer/Lacrosse is a family owned and operated athletic retail business specializing in soccer, lacrosse, and field hockey. Since 1986, we have provided quality products at competitive prices with our first class service. Our store locations in Bethesda, Maryland and Falls Church, Virginia feature a wide selection of apparel and footwear for men, women and youth sizes. If you are a club, school or league, we are capable of meeting your needs at excellent prices. Screen printing and custom embroidery are provided and numbering and lettering are offered in-house. We also participate with sponsors in selling team apparel and related merchandise at field tournaments. We look forward to continued growth and the opportunity to service your needs. Stop by and visit us soon – we look forward to helping you. PJ’s Soccer/Lacrosse provides soccer, lacrosse, and field hockey products to the local communities of Bethesda, MD and Falls Church, VA. Have questions about our products?